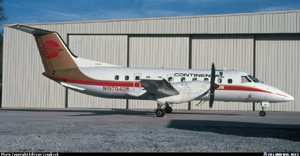 Continental Express Flight 2574 broke up in flight during descent. The horizontal stabilizer, or top of the T-type tail, had separated from the fuselage before ground impact. Examination revealed that the 47 screw fasteners that would have attached the upper surface of the leading edge assembly for the left side of the horizontal stabilizer were missing. These fasteners had been removed the night before during scheduled maintenance. The National Transportation Safety Board (NTSB) determined that the probable cause of the accident was the failure of Continental Express maintenance and inspection personnel to adhere to proper maintenance and quality assurance procedures for the airplane's horizontal stabilizer deice boots that led to the sudden in-flight loss of the partially secured left horizontal stabilizer leading edge and the immediate severe nose-down pitch-over and breakup of the airplane. The NTSB also determined that contributing to the cause of the accident was the failure of the Continental Express management to ensure compliance with the approved maintenance procedures, and the failure of FAA surveillance to detect and verify compliance with approved procedures.